And this year’s fest offered another year of its “Virtual reality/Augmented reality/Mixed reality” track, offering badge holders three days of panels featuring technology experts. Virtual and augmented reality remained center stage at South by Southwest, with countless demos and panels sprinkled throughout downtown Austin. Although these remain fairly new and developing technologies — making some projects low-quality, nauseating and glitchy — festival attendees filled up rooms to listen to experts and waited in long lines to experience stories through VR goggles. For the unfamiliar, virtual reality refers to technology that typically uses a headset or other tools to immerse a user in a fully artificial digital environment. Augmented reality tends to refer to technology that superimposes or overlays virtual objects on a real-world environment, such as with Nintendo’s Pokemon Go app. 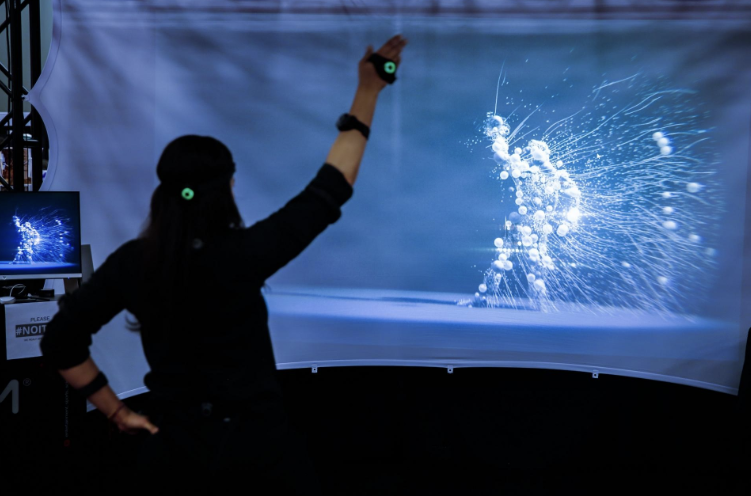 Mixed reality is the mixing of virtual elements with real-world elements, such as a video game that uses digital characters but takes place in a real neighborhood or park. SXSW’s Virtual Cinema room was a festival favorite, judging by the line that wrapped around the hallway of the JW Marriott each morning. The Virtual Cinema, which moved into a larger space in the JW Marriott last year, featured 25 projects to showcase the new medium. One of the most popular projects — and the longest wait time — was for “Mars Home Planet,” where viewers in VR goggles sat in 360-degree rotating plush, red pods. The story, directed by Technicolor Experience Center’s Brian Frager and David Witters, takes viewers through a Martian onboarding center that imagines what Mars would be like if it were inhabited by humans. Other projects, like “Border Stories,” brought users to the frontline of political debates. The experience, directed by Emblematic Group founder Nonny de La Pena, dropped viewers off at the National Butterfly Center along the U.S.-Mexico border to listen to interviews with people who could be affected by President Donald Trump’s proposed border wall. “The Making Of” showed off how high-quality the new medium can be. The pseudo-documentary format, directed by Taiwanese filmmaker Midi Z, is centered around a 3D VR 360 camera to show what happens behind the scenes of a film. Attendees also had plenty of opportunities to catch virtual reality outside of the JW Marriott. Across from the convention center, Round Rock-based Dell Technologies hosted its annual SXSW event, featuring an opportunity to see its “Moon Rover” virtual project while wearing a VR headset on a Jeep-like vehicle that moves up and down. Nearby, international consulting giant Accenture hosted its SXSW “Experience Cantina” with three floors of seemingly endless opportunities to try out virtual reality. Users could test Porsche’s 911 model with VR headsets. Other experiences included opportunities to see how the technology can be used for retail, work and play. That push to show how virtual and augmented realities have moved beyond gaming was on full display throughout SXSW Interactive. Microsoft’s Lauren Cascio and Ryan Hastings discussed the company’s HoloLens 2, which Microsoft touts as a mixed reality headset that overlays VR images on top of what users are seeing in the real world. Cascio and Hastings showed off the ways it can be used to design factories and help employees working in high-risk areas stay safe. But experts in virtual and augmented reality seemed to agree that they’re still in uncharted territory. One keynote session featured Jessica Brillhart, a filmmaker and VR/AR expert, who noted that headsets haven’t taken off because they’re clunky, hard to use and not in their final form. However, Brillhart said being in the early stage of this technology means there are endless possibilities. In a session dubbed “Making VR and AR for Television,” panelists agreed that the technologies have a ways to go -- but when they work, they can pull viewers into a new experience without distractions. Eric Darnell, chief creative officer and co-founder of Baobab Studios, said mixed reality should focus on producing creative and interesting content for viewers and the technology will get better over time. Other panels in the VR/AR/MR track delved into the ethics of the new technology. “A Virtual Minefield: Creating VR Responsibly” walked through the process of making Gayatri Parameswaran’s “Home After War” -- an immersive project that follows an Iraqi father returning home to face to threat of improvised explosive devices -- and the decisions that went into creating a video that could be disturbing for those who have had war-time experience. Amy Seidenwurm, executive producer of Oculus’ VR for Good Creators Lab, said the crew spent a lot of time figuring out what to say to those who could be affected while watching the projected. In a session titled “How VR and AR Change the Way We Express Ourselves,” expert panelists Liv Erickson, Kat Harris, Etella Tse and Eva Hoerth agreed that creators of the technology will need to come up with policies to keep users’ information private, especially when it comes to facial recognition technology.